Harry Styles, Mischa Barton and Cheryl Cole have all frequented The Soho Hotel, a Firmdale haven offering a peaceful haven away from the chaos that carries on all night in the heart of Soho. 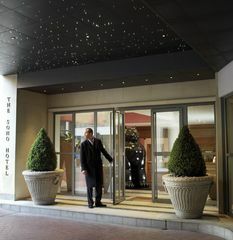 Soho's first deluxe boutique hotel, created by the Kemps in 2004. A wonderful thing about Soho is that in spite of the mad chaos that carries on all night in this unique and thrilling part of London, there are still quiet back-alleys, like the one that contains the stylish and peaceful Soho Hotel. Located between Dean Street and Wardour Street, the main entrance to this Firmdale hotel is on Richmond Mews (off Dean Street). Enter via the narrow alleyway of Flaxman Court from the Wardour Street side and you'll find yourself in the hotel's Refuel Bar, a popular spot among the media industry folk of Soho and celebrities alike. Harry Styles, Mischa Barton and Cheryl Cole have all frequented The Soho Hotel, leading to some fabulous people-watching opportunities and reguarly possies of paps outside. With its 91 bedrooms suites and apartments, all individually designed by Kit Kemp, and its position in the heart of Soho, this luxurious hotel is a very cool place to relax amid some of the world's most exciting nightlife. A stylish and glamorous place to have afternoon tea away from the hustle bustle of Soho outside. The Soho Hotel is a stylish and glamorous place to have afternoon tea, taken in Refuel, the hotel's 100-seat ground floor restaurant, in the drawing room or in the library and served all day long. Tucked away in the heart of W1, afternoon tea here soon helps you forget all the chaos and hustle bustle of hectic Soho outside. Enter from the Wardour Street side and the door is opened for you leading directly into the Refuel restaurant. Sip on fresh leaf tea while reclining on large, deep, comfortable sofas in the spacious, colourful drawing room as cake stands displaying savouries goodies including prawns wrapped in lettuce leaves, a selection of sandwiches, cakes, jellies and scones with large amounts of double cream and jam are brought to your table. As you'd expected, there's a great choice of teas from all-time favourite Earl Grey to other less obvious options of pure rose, Sri Lankan lemongrass, and wild rooibos. They'll even do a wheat-free afternoon tea if you pre-book it. 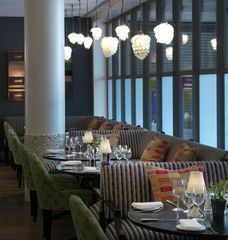 Open-all-day Refuel is the stylish bar and restaurant on the ground floor of The Soho Hotel. A great place for a business lunch in Soho, open-all-day Refuel is the stylish bar and restaurant on the ground floor of the Firmdale's super swish Soho Hotel set up in 2004. Being slap bang in the middle of Soho - enter via the narrow alleyway of Flaxman Court off Wardour Street - it's no surprise that the diners here are drawn from the media industry of the surrounding area - ad agency executives and film producers - as well as shoppers diverted from nearby Carnaby Street and a smattering of stars. Celeb spotting opportunities are high here with Mischa Barton, Cheryl Cole, Seal and Heidi Klum among the more high profile spots. The brightly lit dining room, with 100 seats and a further 60 at the bar, is trendy yet accessible; a striking colourful mural by Alexander Hollweg hangs behind the oak and pewter bar - a nod to the site's previous life as a NCP car park. While Refuel might be a bit expensive, the food is worth it and you can take advantage of special fixed price lunch menus. Options include aubergine salad - which comes recommended - followed by steak frites. If you're looking for a high-end lunch place, and some celebrity diners, Refuel is the perfect place to do just that. Two state-of-the-art screening rooms contain comfortable cow-hide seats. The hotel has two state-of-the-art screening rooms accommodating 45 and 100 guests respectively, one of which is kitted out with 3D technology. They provide the latest technology in terms of sound and projection including the most advanced digital capabilities. Settling back into Poltrono Frau-designed cow-hide seats and watching a movie in this private screening room is a highlight of a stay here. 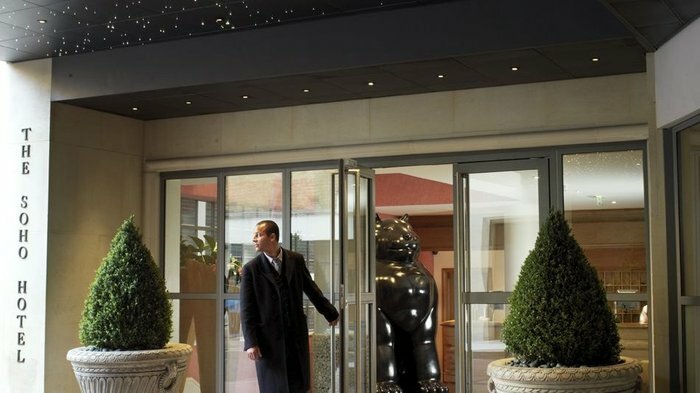 Hotel guests and members of the public alike can sign up for the Sunday Film Club where they dine in Refuel, the hotel's restaurant and bar, and then see the film of the week which varies from a classic to a latest release. The hotel has a fully equipped gym with two beauty treatment rooms. On the basement level of The Soho Hotel you'll find a fully equipped gym with two beauty treatment rooms and a personal trainer on-site. There are specific men's and women's treatment menus overseen by Gina Hemmings Health and Beauty, a well known and qualified personal trainer, Pilates teacher and beauty therapist who employs a team of personal trainers in London. From cheap budget accommodation to luxury 5 star hotels see our special offers for hotels, including Cafe Royal Hotel from 58% off.